LA COMTESSE PERVERSE & PLAISIR A TROIS RESTORED! "Triptych: Lina Romay on the Beach"
In these striking canvases Mick Cantone captures the unique Jess Franco aesthetic of his best period in these studies of the iconic Lina Romay. 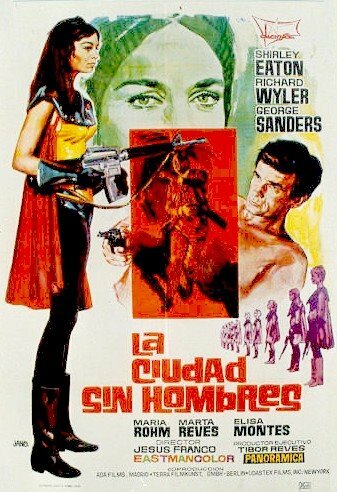 A Jess Franco poster I hadn't seen before. But what film is it promoting?! Seller ships within 3 days after receiving cleared payment . Thanks to Robert Guest for assisting me in finally catching up with Albert Zugsmith's legendary 1962 fever dream, CONFESSIONS OF AN OPIUM EATER. This delirious mixture of slave girls in peril tropes, B movie surrealism, Tong war action and Allied Artists eroticism is presided over by a black clad Vincent Price as a relative of Thomas De Quincey, who wrote the book upon which this is supposedly based. I haven't read it but I did note that Robert Eisen is listed one of the editors. The name rang a bell and I realized that Eisen aka Robert S. Eisen is also credited as "Post Production Supervisor" of two Jess Franco-Harry Alan Towers productions, ISLAND OF DESPAIR aka 99 WOMEN (1969) and VENUS IN FURS (1970). Both films have some interesting similarities of the Zugsmith movie, especially the extended nightmare format of VENUS IN FURS, which like CONFESSIONS... features a befuddled protagonist (James Darren) wandering around in slow motion through a fragmented scenario. Both 99 WOMEN and VENUS IN FURS appeared in America in versions fashioned for the culture of their time, the narration in VENUS is especially of its era and is charmingly dated. The director speaks of his reservations about the final cut in the Blue Underground VENUS IN FURS DVD interview with him included as an extras. It would be interesting to know Eisen's exact contribution. Eisen also is credited as editor on INVASION OF THE BODY SNATCHERS and THE BIG COMBO, two of my favorite 1950s genre pieces, along with many other interesting films. LA COMTESSE PERVERSE & PLAISIR A TROIS restored at last!!! Thanks to Alain Petit for posting on The Franco Lounge at THE LATARNIA FORUMS the wonderful and long awaited news that LA COMTESSE PERVERSE and PLAISIR A TROIS, two of Jess Franco's most visually striking films, have been restored for their original negative materials. These tart black comedies were made back to back in 1973. LA COMTESSE ... has the distinction of being the first French cannibal film and PLAISIR... is one of the director's better adaptations of Sade. Both films are composed in a Cubist aesthetic reflected in the architecture of Ricardo Bofill (note the castle in the cap below) and the use of extreme wide-angle lenses. 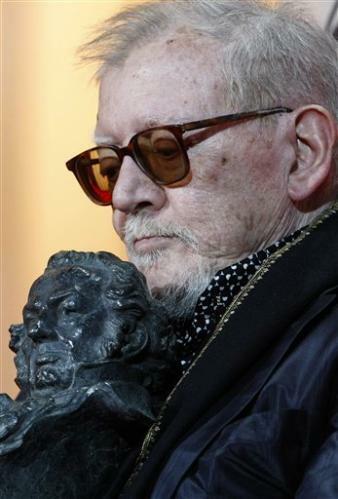 The restoration was made by Stephane Derderian under the guidance of Alain, the noted film historian (THE MANACOA FILES), Jess Franco actor (THE MIDNIGHT PARTY, TENDER FLESH) and screenwriter. Alain wrote the script for PLAISIR... and was there as Franco was editing both films so he made sure these are the original versions as the director intended. They are presented in their OAR of 1.33:1. I'm reposting Alain's original post below from THE FRANCO LOUNGE to help spread the good news. 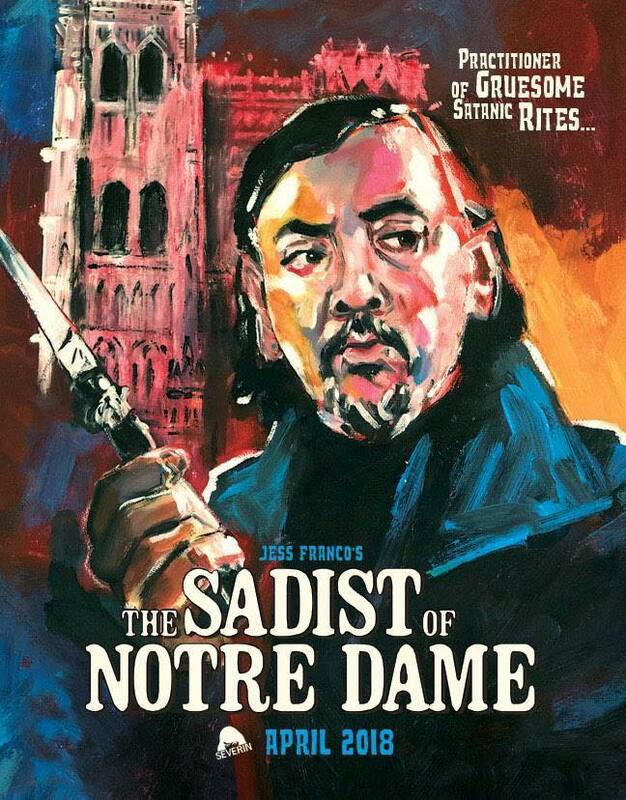 Thanks to Stephane, Alain and all involved as well as THE LATARNIA FORUMS for continuing to be a go-to place for Jess Franco news. I'll be adding some caps posted by Frederick Durand asap. Hopefully these will be picked up by a reliable DVD company who can give them superior presentations with language options and All Region capability. I also hope that Alain, Jess and Lina Romay, who is featured in both films, can be gathered together to do a commentary track. 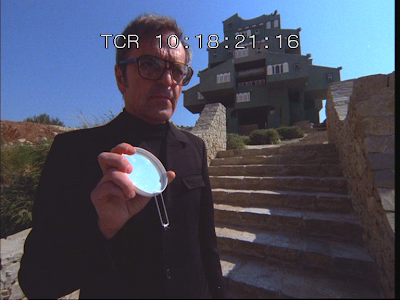 Rader Zaroff (Howard Vernon) signals that it's dinner time on Cannibal Island!